On July 1, 2017, South Texas Regional Medical Center became part of the Methodist Healthcare System family, the most preferred and respected healthcare provider in the area. 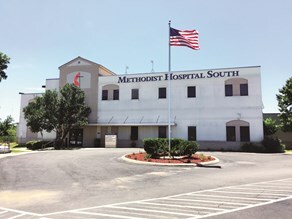 With this change in ownership, we are now known as Methodsit Hospital South. Even though our name has changed, the heart of our hospital remains; it just got a little bigger. The foundation we now stand on is faith-based and driven by our commitment to "Serving Humanity to Honor God." Our clinical team is comprised of healthcare professionals with years of training and experience. These doctors, nurses, technicians, and support team members also bring compassion to their work. They are committed to working together to help ensure that our patients medical needs are anticipated and addressed. We remain a hometown hospital.